On my way to work this morning I saw the most impeccably groomed woman with a sharp, glossy bob, oversized sunnies and a chic belted trench and BOOM! I had the want. Yes folks, from macs to military, it’s officially jacket season and I am most definitely on the hunt. Capes, cocoons, shearling and plaid are all big news this season but if money was no object, I would go for a buttery soft leather jacket – a grown up version of the biker, like this lovely (1). The burgundy collar also sets it apart from the rows and rows of plain black jackets for women; find it here for $295 Canadian dollars (about €210 so actually, not as bad as I’d feared). (P)Leather sleeves are also a big story for autumn – I’ve seen a nice version in A|Wear which I’ll show you soon and Penneys has several on its shelves right now, but this wool mix offering from ASOS (2) looks like good quality and I like the textured sleeves; it’s €117. 12 and available now. River Island’s offerings this season are particularly strong and at the autumn preview I fell hard for this stunning cobalt waterfall number – I only have UK prices but £80 should translate to around €100 which strikes me as particularly good value for such a lovely piece. The checked number on the right is the same price. They're not on the website yet but should land at some stage this month. M&S have a wide variety of styles and shapes this season and if you’re looking for something that will make a serious statement, then look no further than this absolute stunner from Per Una (which is not normally a line I like). This hits stores in November priced at £229 so will probably be close to €300, but it’s an absolute beauty – look at those sleeves! The belt! That gorgeous swingy shape! Any Hitchock heroine would have been proud to have owned this piece. Meanwhile at Warehouse, classic, clean tailoring is the order of the day with this ‘strong shoulder’ jacket (#3, first pic) promising to work well with pretty much anything in your wardrobe. The oversized fit ties in neatly with the autumn’s masculine trend while the asymmetric double breasted front and three quarter level sleeves look modern and sharp. This is £68. The problem I have is I get overwhelmed by choice and can’t pick out a favourite – meaning I’ll most likely be found in my bashed up old parka or army jacket. Again. What about you, have you found your perfect autumn coat? I love the Peruna coat followed closely by the cobalt jacket. Well done! I am in the love with the per Una Hitchcock heroine coat & the burgundy leather. Sadly I've already bought my new winter coat so I'll have to do without. Luckily mine is a masculine tailored style so it sounds like I'll be right on trend, yay me! I love your picks, tis definitely the season of the coat! Love the coat with the fur. It definitely wasn't me that you saw, I wish I could be well groomed like that. I love the blue River Island coat. Gorgeous choices. The cobalt river island jacket will be mine. Stalking the website now. Love the ASOS coat! Actually think I might buy it! Was looking for a coat like this for ages! I have an array of coats, but they lack print and color. I would like to add those kind to the mix. Great post! I am obsessed with the Per Una coat, I've actually been drooling, it's so game of thrones!!! 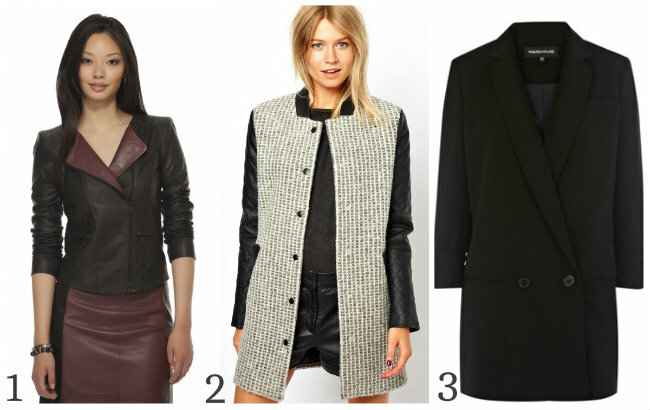 Love this chic roundup of coats, its still quite cold here and I wouldn't mind a few! Thanks for your kind thoughts, have a wonderful weekend! Even though I don't like autumn/winter, coat shopping is something I quite like. Love this year's trends. Ugh I am in love with that coat from ASOS. Although I can't bring myself to buy it yet as I'm going on holiday in a couple of weeks, so no winter clothing yet! !